How many hours should a volunteer help? What is Hovos all about? Is Hovos.com a safe website? As member of Hovos you not only get this sim card free of charge, but we also put a credit on it of $25.00. So sign up and pay the membership fee for the first year of $25.00 and get this amount fully back as credit on your Hovos Travel Sim. Wanna go for this offer? :	click here . No line rental, no set up charges, no contracts and no hidden costs. All you pay is the cost of the calls, texts & data you use. Unlike other travel sim cards that expire in 90 days, with the Hovos Travel Sim your international sim card will remain active for a full 365 days since the last activity on the SIM and there is no monthly top up requirement. Easily manage your balance at anytime and anywhere in the world. You can top up online, set automatic top ups or contact us by email (support@hovos.com). Manage your account online. You can see exactly how much you've spent, view itemised billing and you can access online help. Our 4G global sim card is compatible with all unlocked mobile handsets, you can use your Hovos Travel Sim card in any handset that uses normal, micro or nano sim cards. We will give you 4G in all the countries it is available. Other travel sim cards operate on call backs, where you make a call, get cut off and then are called back within a minute. With the Hovos Travel Sim the majority of destinations are called and connected immediately - just like on your normal home sim. The Hovos Travel Sim comes by default with a UK (+44) mobile number. You can add local country numbers to your sim card in about 50 countries. So if you are in France for a while you can rent a local number for the time you are in France. You can also rent a virtual number from your country of residence and forward all call to this number, which in many cases will be free of charge on your regular mobile contract. We use Tier 1 carriers for crystal clear calls. With the Hovos Travel Sim you do not compromise on voice quality in order to bring you low rates. Once you receive your Hovos Travel Sim you will be able to add international data bundles up to 1GB, for over 100 countries, which can save you a fortune on data roaming! 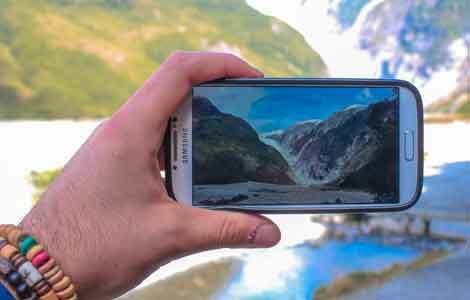 The Hovos Travel Sim comes standard with a UK (+44) phone numbers. You can add more phone numbers to your sim with our Virtual Number service. Choose phone numbers from over 50 different countries. 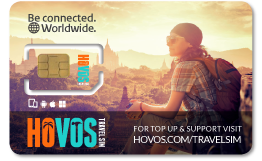 As the Hovos Travel Sim is a global sim card it offers more coverage than the average sim. You can stay connected in 200 countries. The sim card is 4G enabled, which is available in most countries. You can add multiple phone numbers to your Hovos Travel Sim roaming SIM card. Our SIM cards comes by default with a UK number but if you want to add other countries as well there are over 50 countries to choose from. If you live in any of these 50 countries you can use this service to roam on your existing number without roaming charges. There is no limit to how many numbers you can add to your sim. The Virtual Number service is a revolutionary service which gives you the ability to add local phone numbers to your Hovos Travel Sim. This opens a world of opportunities as now you can make and receive calls on local phone numbers from over 50 countries and there is no limit on the amount of virtual phone numbers you can have on your sim card. Get a virtual phone number from over 50 countries; you can choose local phone numbers from many different cities within these countries. We continually add more countries all the time so ensure you signup to the newsletter to be informed of updates like these. There is a small charge of receiving calls on a virtual number.